HOW SWEET it was. Sébastien Ogier won Coates Hire Rally Australia to snare his third straight FIA World Rally Championship, cementing his place as one of the greats of the sport. Still a youthful 31, he has time, certainly the talent, and apparently the inclination, to go on and accumulate championships in the fashion of his countryman Sébastien Loeb. 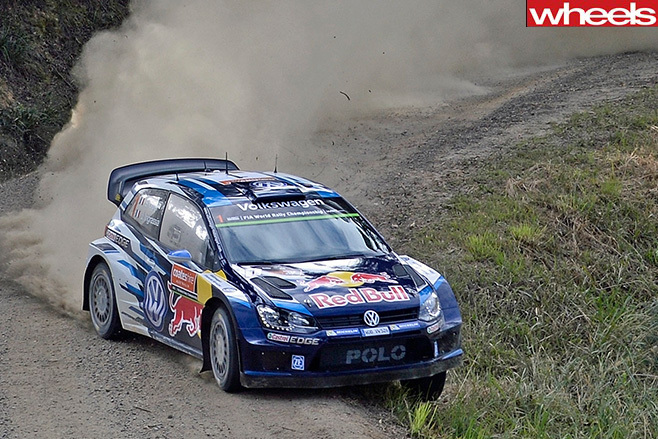 The Volkswagen star finished the 17 stages on the Coffs Coast 12.3 seconds ahead of his Volkswagen team-mate Jari-Matti Latvala, with Citroën's gallant Kris Meeke a further 20.3 seconds behind in third place. But the bare facts don’t reveal the brilliance of the Frenchman’s extraordinary three-day fight for the victory and with it his third straight driver’s crown. On Friday and Saturday, when he was in the unwanted role of road sweeper and massively handicapped by the characteristically slippery loose surface gravel, Ogier just couldn’t match the pace of those who had firmer, grippier tracks to work with. But he kept his cool, didn’t make mistakes and stayed in the hunt. Northern Ireland’s Meeke did not quite inherit the earth, although he led Rally Australia for much of the first two days, relinquishing the lead to the flawless, persistent Ogier late on Saturday. Ogier and co-driver Julien Ingrassia went into Sunday’s final five stages (totalling 68.76 kilometres) with a margin of just 0.3sec – the equivalent of two car lengths - over Meeke/Paul Nagle. Knowing a win in Australia would secure his third world title, Ogier went on the attack on the final morning, relishing the firmer gravel to push out his lead, rubbing his supremacy in the noses of the others with a brilliant win in the final power stage. Cruising just isn’t in his nature. Nor is making mistakes (ignoring his shakedown miscue, when he almost stuck the Polo on its lid!). "So far it's an amazing season. 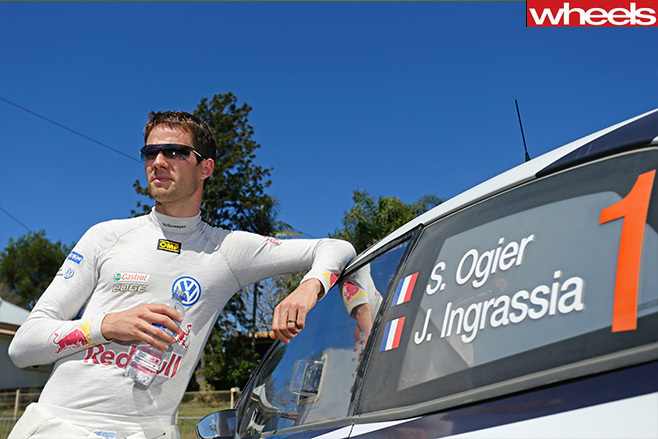 It's the best I've ever done," Ogier said after the title was his. 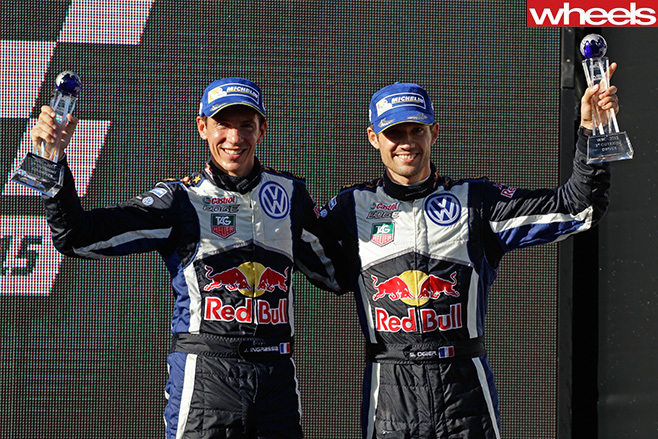 "It was for sure the most difficult rally to open the roads, so it's perfect to get this win for the third time. On paper this one was impossible to win – so is a very beautiful result.” Up with his best ever? “For sure,” Ogier beamed. Latvala/Miikka Anttila started Sunday in third, 2.6 seconds off the lead, but then fought like crazy to claim second over Meeke for a VW one-two. Latvala, who usually applies brutal candour to self-evaluation, conceded that Ogier was simply faster and better in Australia. Ogier's third victory Down Under also landed world championship hat-tricks for co-driver Ingrassia and manufacturer Volkswagen, the achievement coming in round 10 of the 13-event series. Now with 31 wins from 36 rallies – with a win rate of 86 per cent across the three seasons of its involvement, the Volkswagen Polo is by far the most successful model of car in the history of the WRC. Andreas Mikkelsen, Volkswagen’s third driver, piled the pressure on Meeke on the last day, but fell 5.9 seconds behind Meeke in fourth. Hyundai’s Kiwi goer Hayden Paddon again showed his abundant potential, taking fifth, 16.6 seconds shy of Mikkelsen. Some experts are rating him a future world champion. There were amazing scenes when the three-time champs returned to the VW service park to celebrate with the other 52 team members who were part of the victorious squad. Cue champagne sprays. TV cameras poking every which way, thumping ‘80s mood music, and even the obligatory selfie by Ogier and his delighted TV star wife. This Rally Australia was some kind of wonderful. 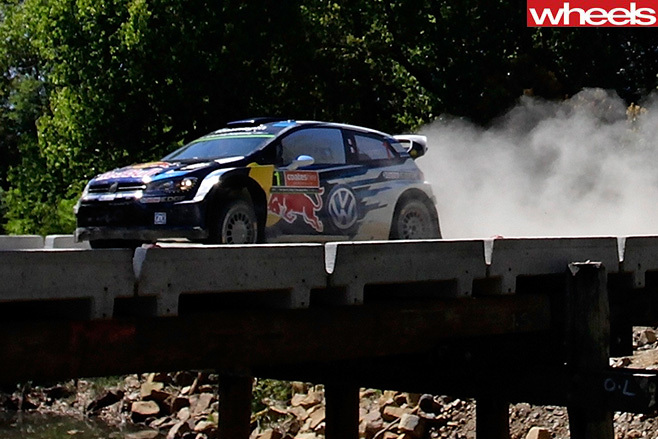 Some of the best action in the WRC, in glorious sunny weather and set in some delightful north coast countryside. A PUNCTURE ruined what was looking like a strong return to competitiveness by defending champ Jamie Whincup and the Red Bull Holden team in yesterday’s Sandown 500. Whincup and Paul Dumbrell led for the majority of the race until a freak puncture caused by a discarded bolt in pit lane agonisingly sank hopes of a third consecutive Sandown 500 victory – and a pogo jump up the points table. 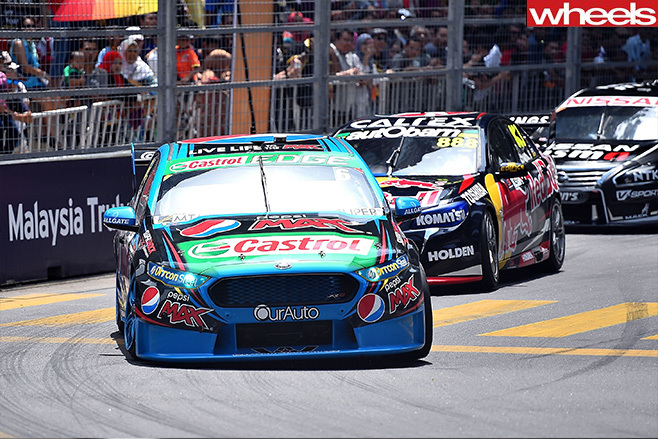 Ford drivers Mark Winterbottom and Steve Owen led home team-mates Chaz Mostert and Cameron Waters for a crushing one-two, sending ominous messages that the 2015 title is looking like a raffle between Prodrive Australia’s leading drivers. Sandown, the first of the enduros, introduced co drivers to the mix, with pressure on the steerers supporting the title contenders. Sandown also brought back two familiar names. Marcos Ambrose indicated he was ready to get into the DJR Team Penske Falcon after sitting out many championship races this year. There was also a cameo return for old-timer Russell Ingall, recalled to the driver’s seat to replace the still recovering James Courtney and sharing an HRT Commodore with Jack Perkins. Leading late in the race, Winterbottom was in cruise control until a Safety Car period to clean up debris decimated his lead. “It killed me. I had a seven or eight second lead, and was starting to think about what’s for dinner. Then the safety car comes out and you’re not hungry anymore!” said Winterbottom. Shane van Gisbergen and Jonathon Webb took third, a bounce back after an ordinary season for Tekno, with Garth Tander/Warren Luff threatening in fourth. 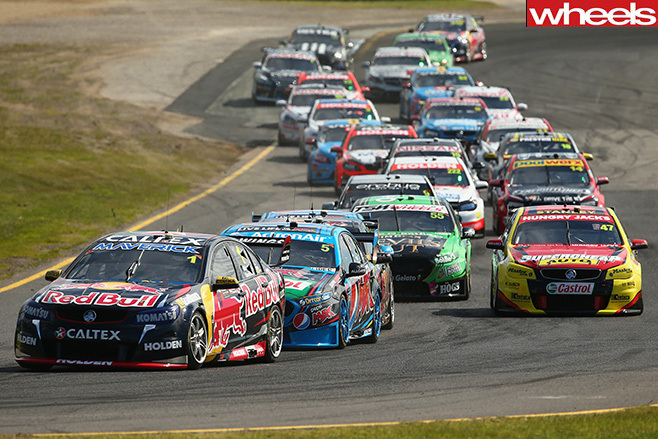 Whincup and co-driver Paul Dumbrell banked pole for the enduro after each took wins in the two Saturday prelim races. Ingall shook off the cobwebs to help Jack Perkins to ninth for HRT, a good result for a returnee and a part timer. Scott Pye and Ambrose finished 12th, hampered after Ambrose’s poor start. “I simply did not get the start procedure right and did not have it in first. A quick reset and we were underway but it cost the Xbox Falcon a lot of spots,” Ambrose said. 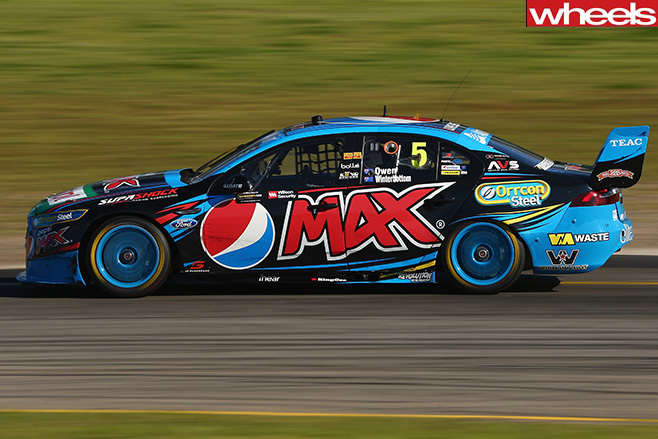 The win extended Winterbottom’s lead over his young intra-team challenger Mostert to 198 points. Emphasising the Blue Oval dominance, PRA stable-mate David Reynolds (fifth at Sandown with Dean Canto) moved to third in the standings, heading into next month’s Bathurst 1000. AUSTRALIAN race followers will get an extra 30 minutes of cot time on Sunday October 9. V8 Supercars has taken the decision to push the start of the Bathurst 1000 back to 11am – the latest The Great Race has ever got underway. Back in the olden days, the start was always 10am. Then in 2007, organisers pushed it to 10.30. The call to start later and finish later was no doubt a hopeful response to last year’s unintended tardy finish, which had a very positive effect of boosting TV numbers because the dramatic finish slipped into the regular (normally high rating) nightly news programming. 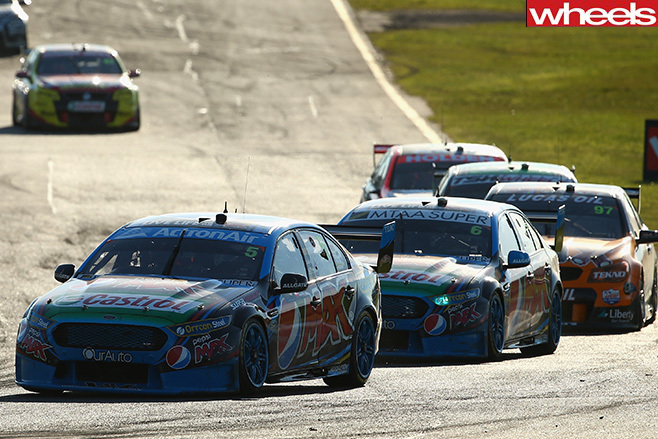 V8 Supercars is no doubt looking for more of that good news. The difference is that this year the telecast will be live on battling Ten and pay Foxtel rather than top-rating Seven. 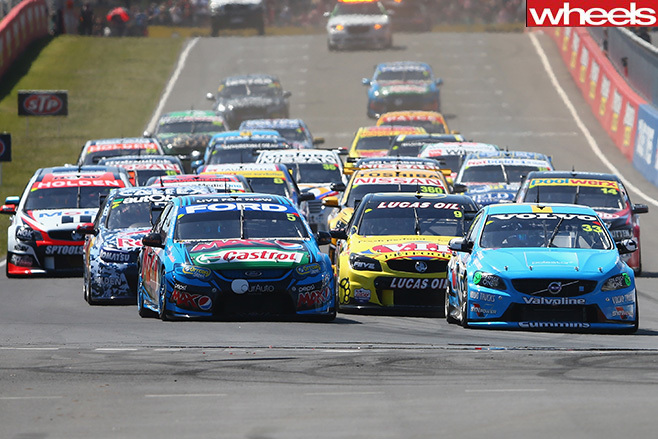 The Bathurst 1000 is the only race on the V8 Supercars calendar not to have a time-specific finish. The arrangement with telecasters is that it runs to its full length of 161 laps, barring aggressive weather acts, or something unusual. Like darkness. There will again be six practice sessions over the three previous days, with qualifying on Saturday. The V8 development series, Porsche Carrera Cup, V8 Utes, Touring Car Masters and Aussie Racing Cars are again on the support program. 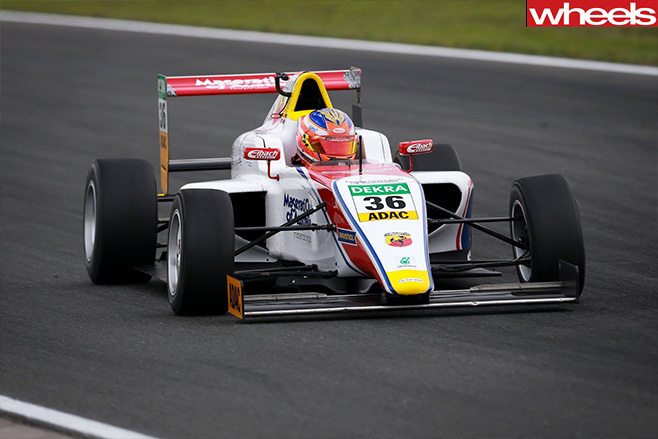 AUSTRALIAN teenager Joey Mawson yesterday shook off a bad start to his weekend to win the third of three ADAC Formula 4 races at Oschersleben, taking his fourth victory of the season and staying in title contention. "This victory is a good way to round off an otherwise mediocre weekend," said Mawson, who took the lead and charged away to win by 8.7 seconds. With three races remaining, series leader Marvin Diensti of Germany will be hard to catch. He is 30 points ahead of Swede Joel Eriksson, with Mawson third but 54 points adrift. YET ANOTHER crack at establishing a V8 Supercars event outside Australasia is the major talking point of next year’s championship calendar. Despite a 100 per cent record of massive fails at successfully selling V8 Supercars in other markets, V8 Supercars Australia is determinedly pushing ahead with its offshore venture on the streets of Kuala Lumpur next August 12-14. V8 Supercars Chief Executive James Warburton also suggests there will be a second race in Asia before too long. This is despite trying and losing races in Shanghai, Bahrain, Abu Dhabi and Austin (Texas) as well as a street race a little closer to home, in Hamilton, NZ. “We expect up to 10,000 Australians to travel to Kuala Lumpur for the event, which will also build exposure for V8 Supercars across Asia,” said Warburton, rather optimistically, perhaps, in light of the fact that the category can’t attract that many payers to Phillip Island. More consistent scheduling throughout the season – with shorter breaks - are other features of the 2016 calendar, which commences with the Clipsal 500 Adelaide on March 3-6. Other notable changes include moving the struggling Phillip Island SuperSprint from November to April 15-17, just two weekends after the Formula 1 Australian Grand Prix. The Sydney 500 will again close the season but has been moved forward a week to November 25-27. “A more condensed calendar will help build even more momentum and still provide adequate breaks for the teams and drivers,” said Warburton. The V8 Supercars races on the 2016 Formula 1 Australian Grand Prix weekend continue to be non-championship events. 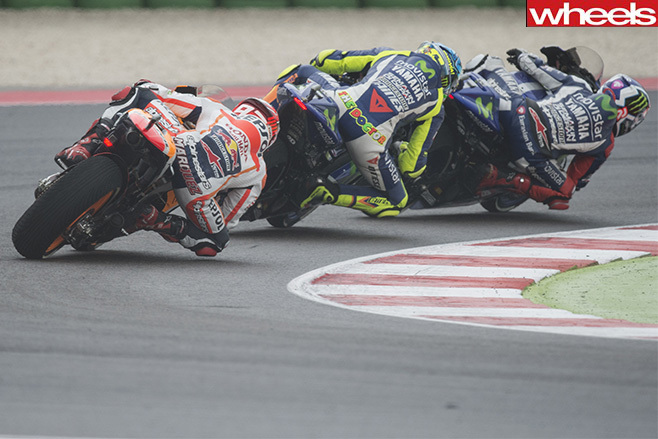 HONDA’S MARC MARQUEZ has taken remarkable victory in difficult conditions at the San Marino GP – but the real winner was Valentino Rossi, who has boosted his lead in the 2015 world championship. Yamaha star Jorge Lorenzo had earlier claimed pole by a handy margin and was favoured to claw back some of the points advantage held by his superstar team-mate. Then the weather gods turned all mischievous. Not long after the start, won by Lorenzo over Marquez and Rossi, rain began to fall. By lap five, rain flags were displayed and riders began to pit to swap to their wet setup bikes. Into the second phase of the race, the rain desisted and a dry line began to emerge. Many back in the pack again pitted to revert to their dry-weather bikes. Marquez came in on lap 18, and immediately began lapping way faster. But the championship contenders persisted with their deteriorating wet rubber. Lorenzo blinked first and swapped to slicks on lap 20, Rossi following one lap later. Then on his first lap back on slicks, Lorenzo binned his Yamaha at high speed, gifting a swag of points to Rossi, who went on to take fifth. 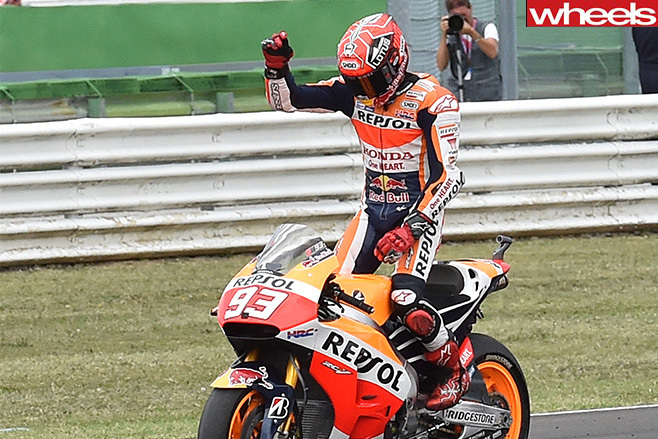 On the podium with Marquez were two disbelieving Brits: Bradley Smith and, after an early low-speed crash, Scott Redding. “It was a very strange race but I'm happy with the end result. It is difficult to explain everything that happened during the race but I think the key was the second tyre change – from wets to slicks,” said Marquez.